Plain white socks these are not. The Atlas sock is a performance dress sock made from cotton, polyester and carbonised coffee. Carbonised coffee? Yes, it helps filter and absorb sweat and odour. Even more, the sock uses strain analysis, pressure mapping and thermal imaging to create something ridiculously comfortable. Seriously, this is one teched out piece of footwear. Most of us spend a good chunk of change on our shoes but ignore socks. That ain't right! 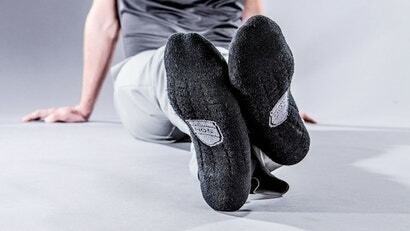 The Atlas sock, made by Ministry of Supply, is a Kickstarter project (that's already reached its funding) that wants to make your feet feel less awful. The main attraction is its odour control. The Atlas sock literally uses carbonized coffee that is "reclaimed from coffee roasters and shops, and is processed through a pharmaceutical process to remove the coffee oils (so it won’t smell like coffee!) and is then infused into our recycled polyester yarns." The idea is to make the odor molecules of your foot attach to the carbonised coffee. It will work like how a Brita filter cleans water. It sounds absolutely ridiculous, but Ministry of Supply claims its Atlas sock is three times better at absorbing odour than a regular cotton sock.